clutch return spring? turbo vs non turbo 240? is there any difference in clutch return springs between turbo 240 and non turbo? my turbo had the clutch return spring changed to a lighter touch spring because the PO had MS and could not push the clutch in. need a Turbo clutch spring or will any return spring work?? 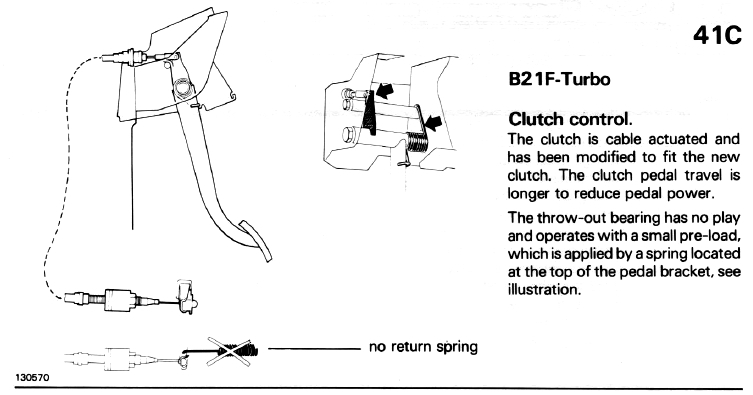 Here's some info on clutch return springs from another thread. 240's did use a clutch return spring until they switched to the dog dish flywheel in '85 with the exception of the diesel cars that got them later than '85. There are 5 different clutch return springs for 240 and they are all still available. 1228794 is for '75 models with M40/M41 trans. Flat flywheel models used a pedal return spring that pull the pedal up. Dog dish flywheel models didn't use a fork return spring and the pedal spring pushes the pedal to the floor. Then there's this tidbit from the '81 New Car Features greenbook that contradicts the previous info since '81 would still have a flat flywheel. that is what i wondered....a lot of options. any idea where I can get a Turbo return spring? going to call the dealer today but ? if they can get it anymore. a lot of things are long gone.